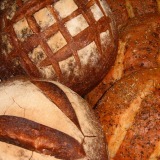 Welcome to Bexhill Farm Kitchen, Bexhill's Speciality Bakery, Delicatessen and Take-Away. Home of the popular date and orange slice. Our Delicatessen items include cheeses, freshly sliced cold meats, locally produced honey, jams and pickles and free range eggs. We also have a large selection of quality biscuits. 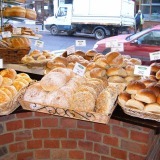 We have freshly made sandwiches using our own bread, filled baguettes and rolls. We have crisp and fresh salad bowls, jacket potatoes and hot and cold drinks including soup in the winter. Bexhill Farm Kitchen, 16a Western Road, Bexhill on Sea, East Sussex, TN40 1DX.